I’m not a huge fan but I decided to commit to the Oxford Mail XC series this year. That’s six 6k races in different locations within Oxfordshire from November until March. In preparation, a new pair of pink Salomon Speed Cross were purchased. There must be some perks to XC racing! 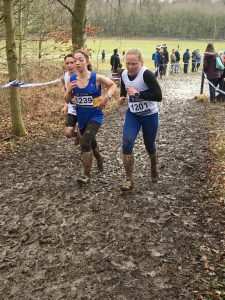 As the winter months progressed the muddy conditions worsened to the point of needing running spikes and strapping them to my feet with duct tape. Trust me, this is not as crazy as it may sound, more of a necessity to stop yourself finishing the race barefoot. My running was consistent and so were my finishing positions. 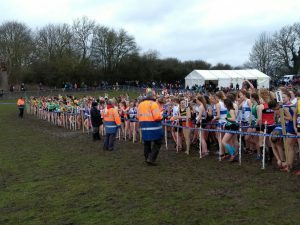 Pleased with my performances I did’t think anything more of it until I received an unexpected email confirming I had been selected to present Oxfordshire Senior Ladies in the Inter Counties Cross Country Championships. Wow….me?! Mum of 2, no longer having the luxury to train as and when I please, I was delighted! 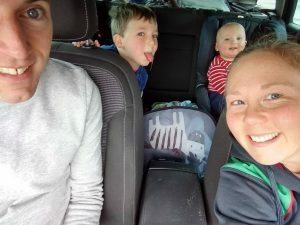 These opportunities don’t come around often so that was sorted, a family weekend in Loughborough was already being planned. With the car jam packed mainly with kid’s toys, snacks to last until Christmas, suitcases, wellies, prams & carriers I thought we had everything covered. Gone of the days when I left the house A) on my own and B) with just 1 small bag and my trainers. We arrived in plenty of time (I still get nervous when racing and hate being late) and made our way to the county tents. 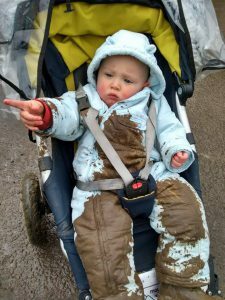 As soon as I saw the field I knew it wasn’t my finest moment to have opted for the pushchair or putting my youngest in a duck egg blue snow suit. The mud was sloshing over my ankles and the first race hadn’t even started. This was going to get messy and my largely white county vest wasn’t best suited to the conditions either. At 11.30am with a warm up complete we took our places in the starting ‘pens’, one behind the other, fastest first. There were 50 county pens with a maximum of 9 people per team, only the top 6 scoring for the county. The countdown began and we were away…. just 500m in I heard my dedicated trio shouting ‘GO Mummy GO’! They definitely top my supporter’s rating (thank you). The 8k (my Garmin said 8.87k) course was testing and certainly a challenge to stay upright in places but I finished in 40.52. I was 3rd place in the Oxfordshire Senior Ladies Team but very much ‘average Jo’ overall 160th/269 finishers. I was extremely proud of myself, I couldn’t have run harder. There are some seriously fast legs out there! I meant to ask you how this went!